Residents in the Queen Anne neighborhood of Seattle, Washington, took to the city’s hills to enjoy the snow on Tuesday, February 12, amid a rare winter storm. 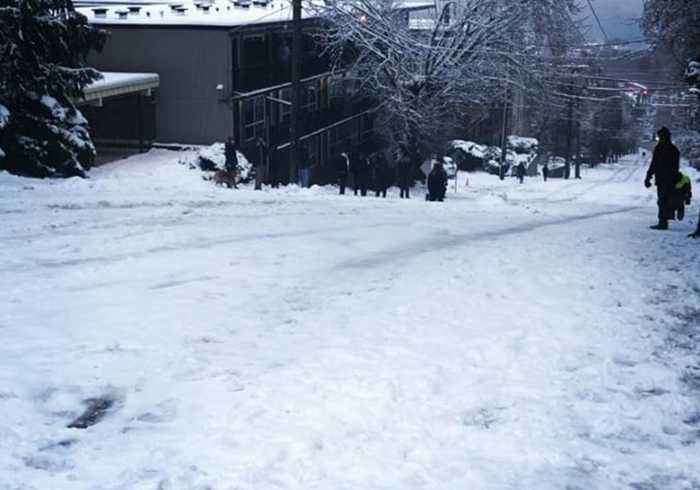 Video posted to Instagram shows a snowboarder doing a flip off of a makeshift ramp in the middle of Queen Anne Avenue. Seattle received another several inches of snow on Tuesday, according to the National Weather Service, who measure six inches at nearby SeaTac Airport. This adds to the accumulation over the past week, after a series of storms dumped fresh snow throughout the Pacific Northwest. The sudden snow has stranded Seattleites at home, caused roofs to collapse, and created hazardous travel conditions throughout western Washington.